Bus Shelter For Homeless, How does it sound? The winter has started. It feels very bad for those who don’t have a house and trying to sleep on the streets. How does it feel for homeless people do not own a home and have to face the strong cold streets to take a nap? Today, I have found a very interesting article about few great peoples and a community who have started a very helpful humanity project. There are sometimes people around us they want to change something, like the two UK women who have created a Bus Shelter Homeless project. A community came together for the people who need a warm bed on cold days. 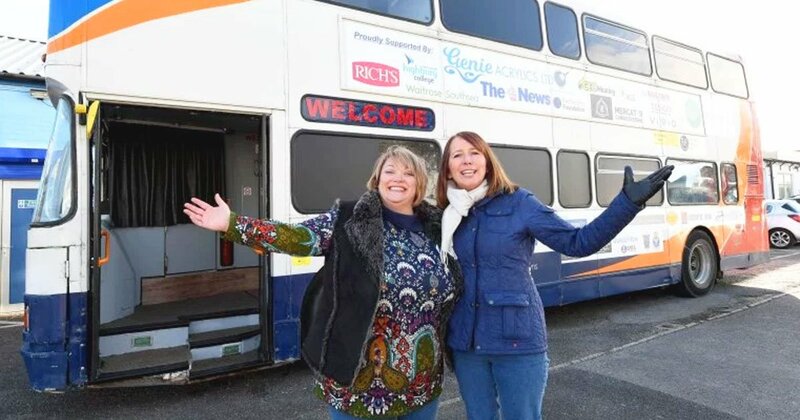 Sammy Barcroft and Joanne Vines are the leaders of charity group named The Rucksack Project and they joined to some organizations turning old useless vehicles into mobile homeless shelters. They bought a Stagecoach bus left behind for scrap. They call out for help to start the double decker bus bed shelter project. It took about eight months with up to 80 workers and a cost like $8000 to let the bus have an own kitchen with 12 beds inside. Most of the renovators donated there own time and talent’s for such a homeless bus project. Normally such kind of project had cost more than $33k. Thanks to people who supported for free. The brand new bus hotel shelter will stand in front of St. Agatha’s Church to help 300,000 homeless people currently living in Britain. Take a look at these pictures and write your own comment.